I am out of bed by 4:30am this morning. The hotel has coffee ready for us in the lobby at 5am, and the bus departs at 5:30am. Today is the optional half day open vehicle Safari in the famous Kruger National Park. Kruger was one of the first big game preserves setup in Africa. Alfred is our driver and guide today. Only a few minutes after we depart from the main gate, we spot a troupe of baboons as they sit on the rocks watching the beautiful sunrise. 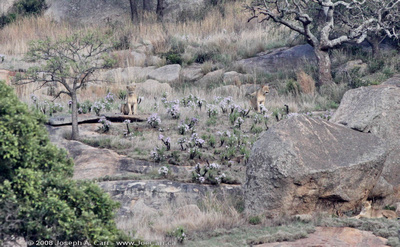 Just down the same road we spot a lioness & her three cubs in the rocks, along with a couple more lions who appear to be sentries. Again, they are facing east toward the beautiful sunrise. Either of these scenes could easily be the model used by Disney for their Lion King movies – African game perched on big round rocks, showing the same beautiful early morning light. Next up is a big herd of buffalo – perhaps 100-200 head. Some of us are concerned for our safety, since these beasts could easily overturn our vehicle and they are only 10 metres away. We move on and spot a baby elephant walking through the bush along the roadway, and then we see a baby Giraffe who still has a dangling umbilical cord despite him being upright and walking on his own. Albert says he is about a day old. We watch while he walks over to his mother and starts suckling. Further down the road we encounter a big bull Elephant. Albert eventually has to move the Land Rover out of his way, since he wants to cross the road where we happen to be stopped. He had already shown us how strong he is by pushing over a tree while we watched from a few metres away. Albert hears about rhinos on the radio, so he tells us to jump in the vehicle and drives quickly to a water hole where I sight my first rhinoceros in Africa (there are virtually none left in Botswana). It is a female White Rhinoceros with her baby – both placidly laying in the mud, at least until the same huge bull elephant we encountered a few minutes ago comes ambling along wanting to use the water hole. The female rhino stands up to face him, and he thinks better of his plan and carefully walks around the water hole and off into the bush – preferring to wait until she and her baby leave. The Zebra are at same water hole, content with the protection from lions that the rhino gives them. After we take a lunch break, Albert is driving us out of the rest area when he hears of a sighting of a leopard. 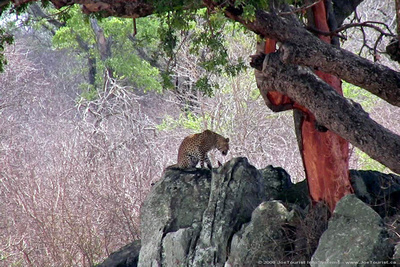 He takes off at breakneck speed and we manage to home in on the leopard as it sits on a rock beside the river. I shoot a few seconds of video before the leopard disappears into the bush. It is a four hour Safari, so Alfred drives us around for the next hour or two, however all we see is a couple more lions as they traverse a dry river bed. It is now late morning, and as I learned in Botswana, the animals all disappear by this time of day. I give Alfred a generous tip – he deserves it for finding all of the “big five” in about two hours! This optional open vehicle safari was originally scheduled to take place in the afternoon. Craig knew the prime time for safaris is early morning, so he rearranged things for us. This is the sort of service an excellent guide will routinely do for tours, ensuring his clients get the maximum enjoyment from the arrangements. Phineus and Craig also took the people who did not book the optional open vehicle safari around Kruger Park in the bus. Obviously this group was not as mobile as we were in our Land Rover, however Kruger has mostly paved roads, so the group on the bus spotted a surprising number of big game as well…and they had the comfort of air conditioning. This entry was posted in South Africa and tagged safari, wildlife. Bookmark the permalink.